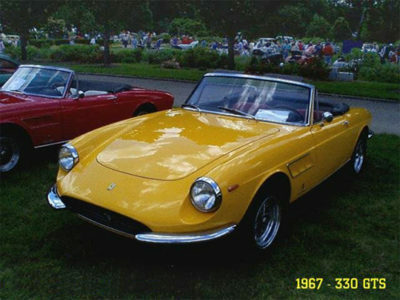 This beautiful car in original condition was one time owned by Italian-born racecar driver, Luigi Chinetti. Luigi was a driver in 12 consecutive 24 Hours of Le Mans races, winning 3 times. He also won the Spa 24 Hours race twice. He was a long-time American importer of Ferrari automobiles to the United States. This car was specially ordered without a radio or air conditioning. This was done to reduce weight and add speed. It is equipped with Daytona Inlet Manifold with 6 carburetors and produces over 400 horsepower. Luigi also ordered a 3rd seat in the car for his granddaughter. Car owner Scott Isquick shares an interesting story on how he came to buy this car. His wife, Pamela, was racing their 300SL Gullwing at Lime Rock in Connecticut and saw the 330 parked across the paddock. She remarked that it was a cute car. Scott approached Luigi about buying the car. Luigi was getting ready to send it back to Europe because he couldn’t sell it. He offered it to Scott for $10k. Scott balked because he had to pay OH sales tax. A few weeks later Luigi countered with a price that discounted for the OH sales tax. They flew to NJ to pick up the car and drove it back at 55 mph.